Rizk Casino was opened as late as 2016. New players will be able to take part of Rizk free spins and other fun promotion. Try out the Rizk Wheel with Captain Rizk as your host. More about the casino in our review below. What differs Rizk Casino from other online casino is the opening bonus. Players get to spin on Rizk Wheel. Depending on what the wheel stop at, they can win anything from casino spins to free money. But please. Make sure to check out your country section for any specific bonuses, so that you don’t miss out. We have country section for Canada, Australia and the UK. Also Rizk are hosting several promotions for players that are active on the site. You find more info on their website. Rizk Casino has made quite a first impression on the gambling enthusiasts. They have started with a bang, offering multiple games across multiple software platforms. One thing is for sure: no one will be left disappointed. Founded in January 2016, the online casino has skyrocketed in the popularity charts. Everything about them looks slick and new. An imaginary superhero character doubles as the website’s mascot, promising a fast, reliable experience. And that is exactly what they deliver. A player will find everything on Rizk Casino, right from excellent video slots, to interesting table based games, and even a live casino. Some of their outstanding games include Guns ‘N’ Roses, Esqueleto Explosivo, Pearls of India, Lady of Fortune and The Invisible Man. They also provide a good selection of table-based games such as Oasis Poker, Perfect Pairs, and Pai Gow. The mobile version of Rizk Casino is just as sleek and well designed as the website. Players will not have any trouble in accessing their favourite games on the smartphones and tablets. The added advantage is that they can play the games while commuting to work, in office, or just about anywhere. Another benefit of the mobile version is that a player does not need to download the game. They can access it directly from the web server. The online casino promises to leave anyone who visits the website entertained and enthralled. They also promise to reward players in the best possible manner. Rizk Casino is one of the rare virtual entities that offer constant rewards and bonuses. First time players who sign up can instantly expect a welcome cash bonus and other freebies, such as a free spin. The extra cash awarded to new players can be used to play additional games on the website. 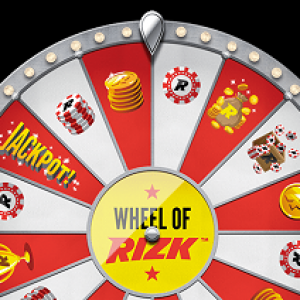 Rizk Casino also features an exclusive rewards program modelled on the lines of Wheel of Fortune. The program awards cash prizes and other gifts to players who have gathered enough loyalty points and to newly registered users as well. What makes the online casino one of the best in the vertical is that they offer a superior level of customer service. Each and every query or complaint is attended in the quickest time possible. This leads to an excellent user experience. The other arena where Rizk Casino scores over the competition is in the deposit method. The website again offers a wide variety of options to suit the player’s preference. This includes major credit cards and other online sources of payment such as Skrill and Neteller. Rizk Casino ticks all the boxes required for a top notch online casino. They have interesting games, big rewards, and they guarantee safe payment.